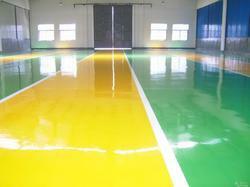 Manufacturer of a wide range of products which include ryot4 floor coat, epoxy floor coating and epoxy coating. Being a market leader of this domain, we present patrons with the finest quality of Ryot4 Floor Coat. Used for coating of floor from 500 micron to 3mm thick, the Ryot4 floor coat is known for its ability to tolerate adverse weathering conditions. Known for its excellent bonding capacity, the Ryot4 Floor Coat is processed by using cutting-edge machinery. Epoxy Floor Coating is seamless joint less Epoxy self leveling coating varying from 500 micron to 3 mm thick from plain color to those with designs from mosaic finish to that of granite finish. Easy to clean, Decorative effect, anti skid property, low maintenance cost, high abrasion resistance, low dirt pick up, excellent mechanical properties, resistance to oil, chemicals, solvents, detergents etc. Ideally suitable for pharmaceuticals, food industry, bottling plants, Automobile service stations and many more where above property is in need. 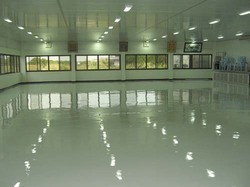 We are successfully ranked amongst the trustworthy entities offering a wide range of Epoxy Floor Coating. Epoxy is a plastic adhesive material made from a class of synthetic thermosetting polymers containing epoxide groups. 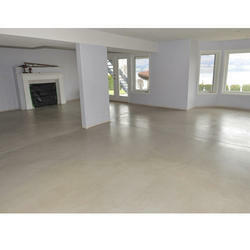 Such chemical foundation helps coating stay for very longer time on the floors. Industries, factories, offices and villas are the places where clients have appreciated such coating. 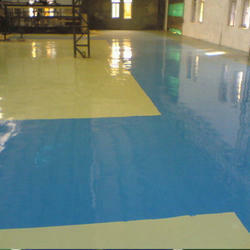 Our professionals ensure to use advanced machines and tools while installing the epoxy coating on the floor. Apart from this, the coating is made available in variety of colors.